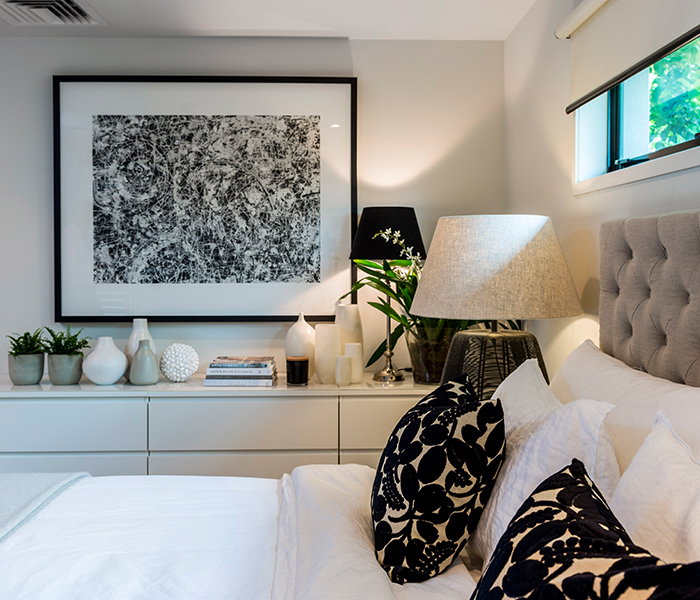 Moving from their well-loved Queenslander home to a fresh new abode in Bulimba, these clients presented Gail Hinkley Design with an interior design challenge: create a new, welcoming style befitting a modern family home, all while retaining many of their existing furniture pieces. 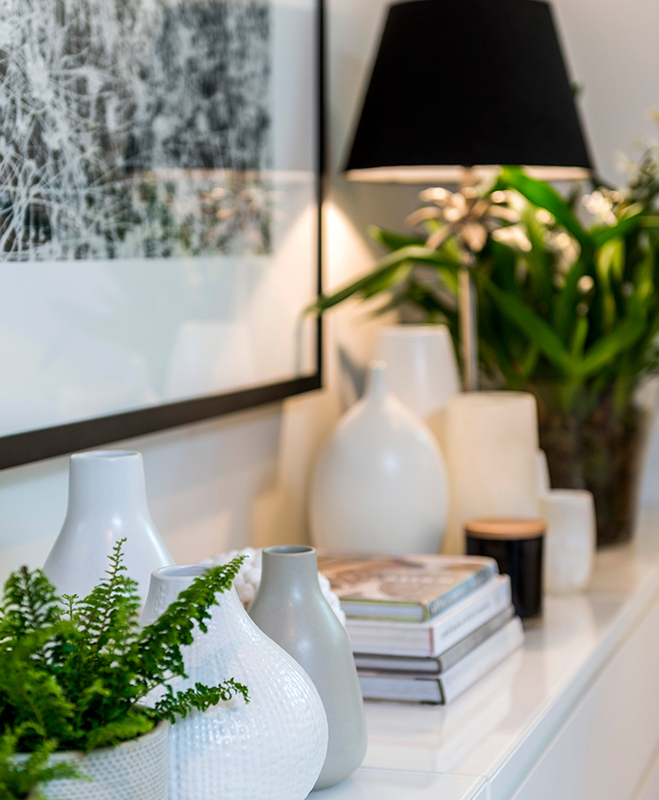 The clients, Ange and Geoff Sewell, asked Gail Hinkley to present their new, modern home in a warm and welcoming style and at the same time use as many of their own furnishings as possible to keep within their budget. 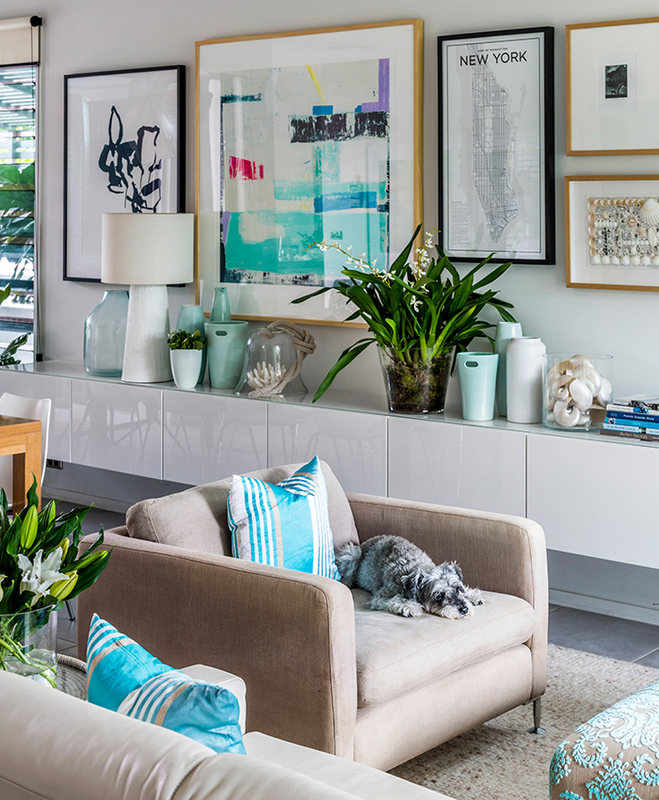 The major furniture pieces are upholstered in natural linen, which is the perfect backdrop to the colourful cushions, while their existing large ottoman-style coffee table was reupholstered in an aqua flocked Designers Guild fabric. 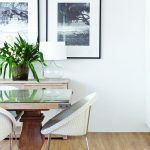 The large living and dining areas have been connected by installing a fourmetre-long suspended wall unit along their common internal wall, which serves as additional storage as well as a TV unit. 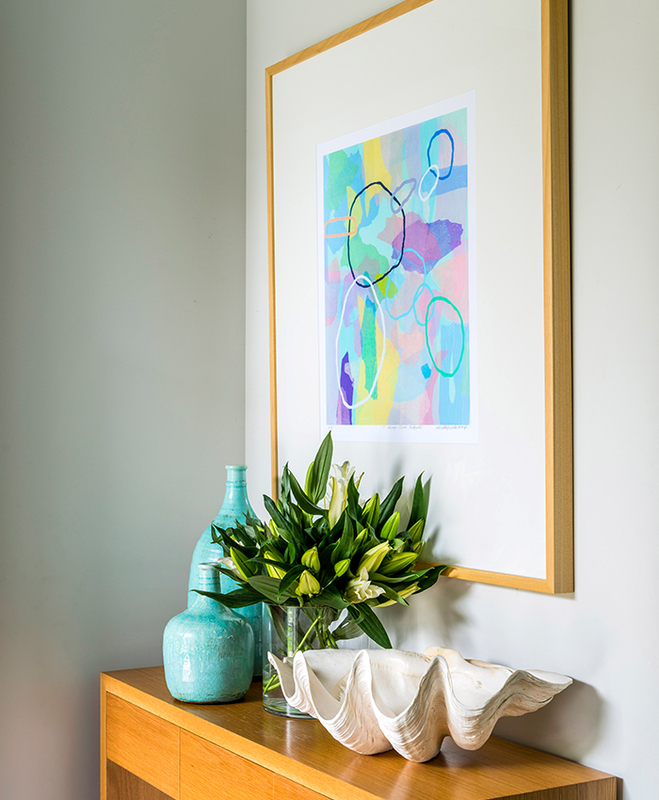 Artwork and accessories inject colour and warmth. “Matching fabric was used for the cushions along with a striped Designers Guild fabric chosen to complement the large Ali McNabney-Stevens print and pull the colour together in this room,” Gail explains. 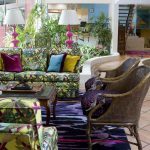 The same Designers Guild fabric was used in the adjacent family room along with natural linen sofas and a large, whitewashed rattan coffee table for a relaxed feel. 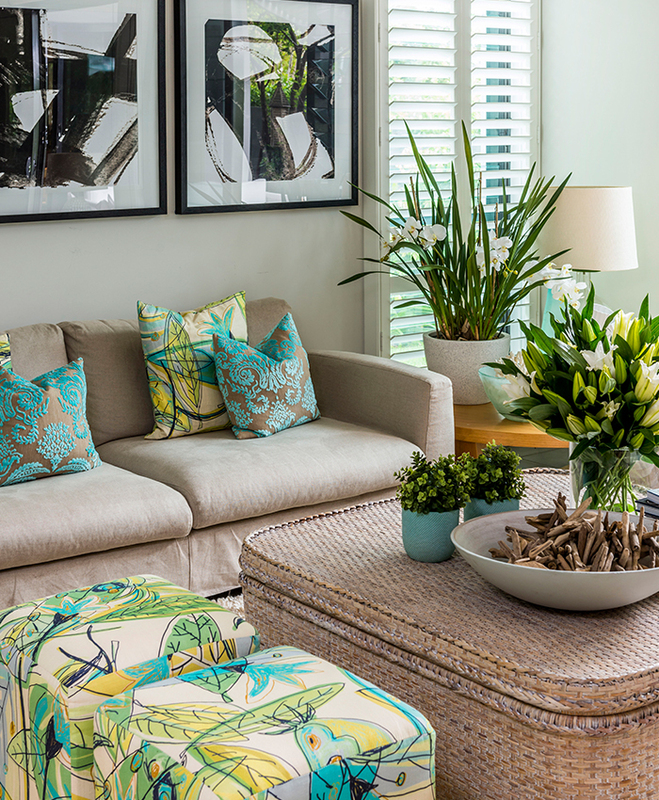 Two ottomans upholstered in tropical fabric by Christopher Farr provides additional seating. “The strength of the black and white Designer Boys prints really completes the whole look here,” Gail adds. 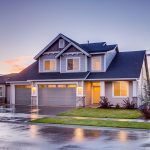 Shutters were installed to further soften the interior, and the upstairs bedrooms and staircase were carpeted. Upstairs, the master bedroom has a sophisticated, luxurious feel thanks to furnishings and accessories in black and natural tones. Both Gail and the Sewell family are delighted with the result: a truly welcoming family home. Gail Hinkley has owned and operated the iconic Signature on Hastings,Noosa’s most well-known homewares store, for more than 25 years. 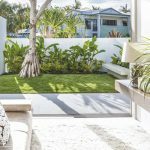 Her interior design work has seen her undertaking a wide range of projects, from Airlie Beach to Melbourne.